Smaller one of a pair of adjacent, self-contained holiday cottages. Little Court Cottages are the perfect option for people visiting Gloucestershire for a holiday or for those who need to be based in this area on a temporary basis for business. A hotel may be fun for a couple of days, but as any seasoned traveller knows well, that novelty soon begins to wear thin. For a temporary stay which necessitates more than just a couple of days away, Little Court Cottages offer you the comforts of a home away from home. 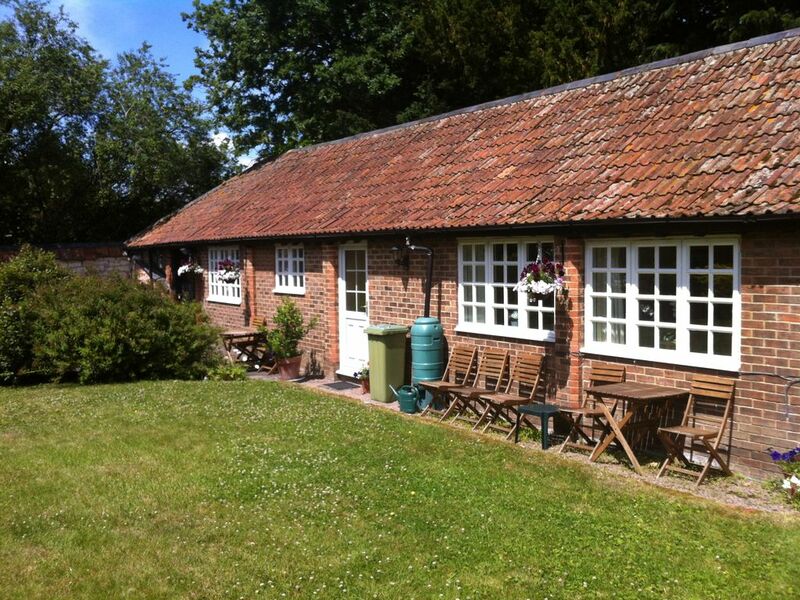 Our cottages are self-contained and single storey. Both cottages are fully equipped and provide all the facilities required to make your stay as pleasant as possible. We have two cottages; one which sleeps 4 guests and another which sleeps 2 guests. Both have an open-plan sitting room with kitchen and dining areas. The larger cottage has two bedrooms (1 double plus a twin) with a separate shower room/WC. The smaller cottage has a double bedroom with an en-suite shower room/WC. The cottages are adjacent to each other, but otherwise completely separate. We have designed our cottages to offer the things which a hotel might not. Our location is convenient for both the M5 and the M4. We are an easy drive from Gloucester, Cheltenham, Stroud or Cirencester. We provide our guests with a secure base while they are away from home, tailored to suit the needs of the holidaymaker or the business user. We have recently installed a high speed broadband link and there is free Wi-Fi internet access in the cottages – bring your laptop and keep in touch. Little Court Cottages are within walking distance of a quiet, friendly pub serving good food and a village shop/post office; there are also several large supermarkets locally. Therefore, it is easy to self-cater – if you prefer, we can even stock the fridge/freezer in advance of your arrival by arrangement. This is particularly useful for people who have special dietary requirements. If your visit necessitates more than one week in this location, guests may leave their possessions in their cottage even if they prefer to return home for the weekends. Alternatively, why not invite your partner or family to join you in Gloucestershire for a weekend in the country. Duvets with quality white cotton bed linen and towels are provided free. If your stay is for longer than one week, we can arrange for regular cleaning and linen change as required. Our automated entry system provides security and privacy – there is ample parking within our grounds and all guests have independent access via a clicker with their cottage keys. This is particularly important to lone female executives seconded to this area. As the cottages are in the grounds of the owners' Grade II listed home, you are equally not isolated – there is usually somebody around in case of a problem. Furthermore, this allows us to be flexible about your arrival and departure times. En suite shower room/WC accessed through master bedroom. This is fully tiled and there is a full-size walk in shower cubicle with an electric shower. Towels are provided and there is a heated towel rail to keep them dry. Electric heaters are present in all rooms and electricity is included in the price. Quality white cotton bed linen is provided together with tea towels and oven gloves, etc. Little Court Cottages are located in the garden of the owners' house and have a pleasant sitting out area with table and chairs provided. There are two steps into the cottage which make is suitable for people with limited mobility, but there are no specific modification for disabled persons.